There are two things to establish right out of the box about Carnage, Roman Polanski’s faithful adaptation of Yasmina Reza’s international smash-hit play God of Carnage. 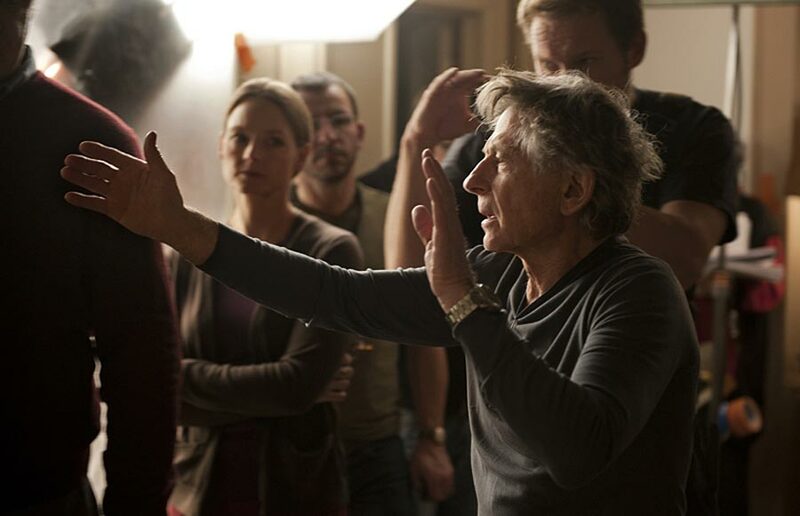 One is that, since the play takes place in a single apartment, in real time, with only four characters, and since this is a “faithful” adaptation, even the greatest director in the world (and there are certainly many who believe Polanski to be the greatest director in the world) would be hard pressed to make it a truly “cinematic” experience. In other words, yes, it’s “stagey”. The second is that there need be no “spoiler alert”, because the material itself is so slight that the story is the premise: two couples, meeting to discuss a violent incident between their children, end up getting more and more aggressive with each other. That’s it – in terms of story there’s nothing more to say. The good news is that, within that slight frame, there are many, many funny lines – I laughed out loud a lot, and the audience around me also seemed to be having a good time. Polanski and his A-List cast were all on the same page – they knew that the material was hardly going to change people’s lives (or win them Oscars) so they all played it for laughs. In its way, it’s a latter-day Neil Simon comedy – build, build, joke. Build, build, joke. Repeat. Those laughs don’t come immediately. The first half hour is a bit of a strained set-up, and teeters on just becoming tedious – and then the first real joke breaks the dramatic dyke, and we’re in for a fun ride from then on in. I don’t know whether this is a very bold writing choice, or whether the first third simply isn’t funny but was meant to be. Regardless, the whole film is only eighty minutes, so it’s pretty hard to get bored or annoyed with it – especially with such a cast. Kate Winslet definitely comes off the best; her Nancy Cowan feels the most rounded of four essentially dreadful people, and is probably the “best” role in terms of the writing. Jodie Foster verges on overplaying it, but scrapes in below that line; her character is really annoying, which doesn’t help. Both are essentially well cast. It is painful to say that the two brilliant actors John C. Reilly and Christophe Waltz – Oscar winners both – are unfortunately a little miscast. Reilly plays Michael, the role James Gandolfini played on Broadway; Michael purports to be relaxed and cool, but there is constant allusion to a serious heavy hot temper lurking beneath the surface, and Gandolfini possesses a terrifying hidden ferocity, whereas Reilly can’t really pretend to be anything other than a likable teddy bear – it’s hard to believe there is ferocity beneath his friendly surface. Waltz has the better male role; his Alan really is a cool customer, and he’s got more funny lines. His accent is a great puzzle, however; I was happily sure that they’d simply made Alan some vague US-dwelling European, whereas my partner was sure that Waltz was doing an American accent; in the end credits, there is revealed “Dialect Coach to Christophe Waltz”. If he was attempting an American accent, he did not succeed, by any stretch of anyone’s imagination; if he was playing a “European”, it unfortunately dilutes the class warfare that is the script’s major tilting board. I don’t know why Polanski (who shot the film in Paris) made this film in English, and set it in the United States, unless it was a requirement of his Producer; the play began in French, set in Paris, and I think the dialogue would have remained better placed there. Some of the translation – from a screenplay by Reza and Polanski, neither of whom can claim English as their first language – is clunky; references to Ivanhoe and Jane Fonda are just weird, as though there was meant to be a final script meeting that never happened and intended cuts or changes were never made. And Alan’s unending (and very annoying) habit of talking on his mobile phone in front of all the others – rather than simply stepping into the hallway or kitchen – may have worked on stage, where the parameters of the physical space lull us into accepting the living room as the entire apartment – but on film, where we have already been shown that the apartment has multiple spaces, it just feels either very false or makes Alan downright socially sociopathic, which he is not. It also gives the film a sense of already being dated – there’s a lot made of that mobile phone. When we left the cinema, and were talking about the film, my partner, who doesn’t get to see many films with me as I’m often at media screenings on my own, remarked that she didn’t really feel like she’d “seen a movie”. 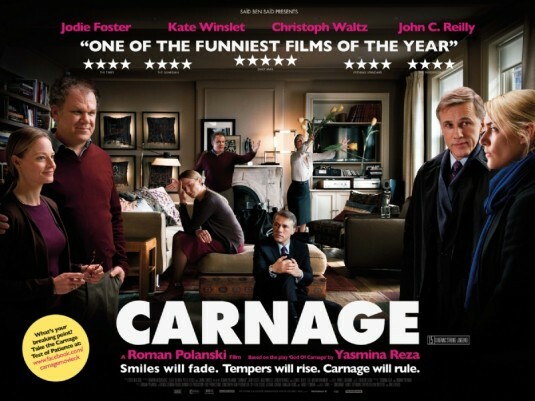 Carnage is a little like that – more of a curiosity than a major experience – but it’s fun and funny, and sometimes that’s enough.